Four minutes. That’s how long Dzhokhar Tsarnaev stood there, next to the kids watching the Marathon on the sidewalk on Boylston Street, outside the Forum. Four minutes. That’s how long he had to consider what the pressure cooker bomb he had in his backpack would do to those children, the Richard kids. He had 240 seconds to play in his head the way the BBs and tiny pieces of metal would be propelled, like hot razors, into those kids. After four minutes, Dzhokhar Tsarnaev turned right, while everybody else’s head jerked left, looking down Boylston, to where the bomb planted by his brother Tamerlan exploded in front of Marathon Sports, killing Krystle Campbell. Dzhokhar Tsarnaev was heading toward the corner of Gloucester Street when his bomb detonated. It ripped through 8-year-old Martin Richard, like a meteor. It left a gaping hole in his midsection, from which virtually all the blood drained from his small body. “There’s little that occurred the week of April the 15th . . . that we dispute,” attorney Judy Clarke told jurors. Denise Richard’s sight was cloudy, from the projectile that had shattered her eyeball. She could barely see the outline of her son. It was just as well, because had she been able to see clearly, Denise Richard would be even more haunted than she is already. Lingzi Lu, a Boston University student from China, lay nearby. Like little Martin Richard, she was dead. Like Martin Richard, virtually all of the blood in her body had drained onto the sidewalk. The government’s opening salvo in the federal case was strangely restrained, as if Bill Weinreb and the other members of the prosecution team knew the case they were about to present was so disturbing, so poignant, so horrifying, that to overdo it would somehow be an insult to those who fell dead or dismembered on Boylston Street on Patriots Day 2013. Weinreb avoided purple prose, but his description of what Dzhokhar Tsarnaev and his dead brother Tamerlan did that day dripped blood red. And in her response, Judy Clarke, Dzhokhar Tsarnaev’s attorney, gave us all permission to drop this charade of calling her client the accused Boston Marathon bomber who allegedly killed four people and maimed so many others. Clarke broke the hearts of the conspiracy theory wackos who have held handmade signs outside the courthouse and filled the Internet with absurd tales of the government using actors to stage the Marathon bombing, that the Tsarnaevs were patsies in some grand conspiracy orchestrated by an Orwellian government. Sitting just yards away, in Courtroom 9, were Denise and Bill Richard, who lost their son, Heather Abbott, who lost her leg, and Transit Police Officer Dic Donahue, who nearly lost his life, bleeding out in the crossfire on Laurel Street in Watertown. Weinreb used his opening to deliver this bombshell: It was Dzhokhar who killed his brother, running him over in his haste to escape the police dragnet that closed in on them in Watertown. The bullets fired into Tamerlan by Watertown Police Sargeant Jeff Pugilese contributed, Weinreb said, but it was the injuries from Dzhokhar running him over that actually killed him. Much of what Weinreb had to say was already public knowledge, but that part about Dzhokhar Tsarnaev standing next to the kids for four minutes was a new detail, and it was devastating in a way that was unexpected. This was not a rash act. The children killed and maimed were not collateral damage. They weren’t unlucky. They were targeted. Explicitly. When Dzhokhar Tsarnaev put that backpack down outside the Forum, he had to know he was going to kill and dismember children. Clarke must have known how devastating that piece of information was. Even as she admitted her client had done what she called “the incomprehensible, the inexcusable,” she offered an excuse that was easy to comprehend: His big brother made him do it. While Weinreb told the jury that Dzhokhar became radicalized by reading Islamic extremist propaganda, by watching Islamist snuff films, by reading a magazine put out by Al Qaeda, Clarke said it was Tamerlan who gave Dzhokhar all of his misguided direction. Even before Weinreb and Clarke gave their opening statements, Judge George O’Toole made it clear he was going to severely limit the amount of leeway he was going to give Tsarnaev’s lawyers in mounting the “my brother made me do it” defense. O’Toole said he was granting as “a general matter” a motion filed by the prosecution to prevent the defense from presenting so-called “mitigation” evidence aimed at reducing Dzhokhar Tsarnaev’s culpability during the first phase of the trial, which is aimed at establishing guilt. The prosecution argued that evidence should be presented during the penalty phase of the trial, which — given that the defense has stipulated most of the prosecution’s case — is now inevitable. O’Toole said he couldn’t give a precise ruling, but he made it clear he was going to curtail attempts by the defense to make the guilt phase of the trial about Tamerlan Tsarnaev. O’Toole acknowledged that introducing some evidence about Tamerlan is inevitable, given that he carried out the bombings, too. But he said how much of that evidence will be introduced during the first phase of the trial “depends on its relevance” to Dzhokhar’s guilt. Weinreb suggested that the evidence pointing to that guilt is overwhelming. “He pretended to be a spectator, but he had murder in his heart,” Weinreb said of Dzhokhar Tsarnaev. 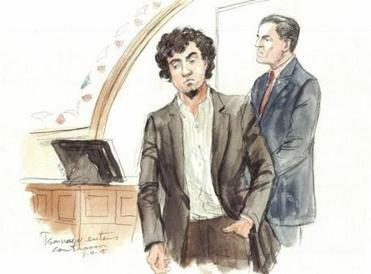 Weinreb said Dzhokhar Tsarnaev’s bomb shredded flesh, severed arteries, lit people on fire. While the city reeled, as surgeons pulled saws to amputate legs, Dzhokhar Tsarnaev walked into the Whole Foods in Central Square and bought a gallon of milk. It was Dzhokhar Tsarnaev who got the gun used to murder MIT Police Officer Sean Collier, Weinreb said. Collier’s bloodied gloves were found in the car Tsarnaev drove that night. When he was captured, cowering in a boat in a back yard in Watertown, Dzhokhar Tsarnaev’s motive was literally written on the walls, on the wall of the boat, in pencil. He bombed the Marathon to punish Americans, because America was killing Muslims. Paradise would last forever. A lot longer than the four minutes that Dzhokhar Tsarnaev stood there, next to the kids whose bodies and souls he destroyed before he went to buy some milk.